"Of course, I'll have to walk the trail myself"
Kim Wright author of the The Unexpected Waltz and the upcoming novel The Canterbury Tales, discusses how traveling the Canterbury Trail on a research whim actually led to long lasting memories, spontaneous adventures and a few unexpected characters. That’s how I ended up in a stall in the ladies room of a posh New York restaurant frantically Googling the phrase “Can you walk the Canterbury Trail?” I’d promised to do it without bothering to check if it was even possible. Luckily for me and my book, The Canterbury Sisters, it is. The old route is broken by highways and power plants but about forty miles of it is still accessible to modern day pilgrims. Google assured me that I’d need a guide since the trail markers were “few, small, and hard to find.” So I poked around some more on the Internet and ended up hiring a private guide, a woman named Jane who’s about my own age, and who leads custom-designed tours all over England. “How dear?” I asked and then the owner had to be called in and after lots of debate I was told I could have the pork chop and a bottle of French burgundy for seventeen pounds, which is a little less than twenty dollars. “Let’s go for it,” I said, and the whole pub cheered for the high-rolling American stranger. We started talking and the townspeople were utterly shocked I’d gone to such trouble to describe the small villages which dot the Canterbury trail. I ended up sharing the wine and getting pulled into a game of darts. I’m a novelist now, but I was a journalist first, and the lingering reporter in me won’t rest until I explore what I write about. Explore it in the step-by-step sense of walking a meandering, confusing, forty-mile trail or befriending the locals in a far-flung British pub. It’s the small details that make a book take flight, and halfway through the darts game (God, was I bad), one of my teammates leaned toward me and whispered in my ear, “Come with me to the smoking garden.” The smoking garden is an outdoor area behind the pubs, where people smoke…and do other things too, I guess, based on the fact that all of his blokes were watching and snickering. I told him “no, thank you,” but softened the blow by saying I’d make him a character in my book. I don’t think he believed me, but that night was the impetus for my favorite chapter. In the vein of Jojo Moyes and Cheryl Strayed’s Wild, a warm and touching novel about a woman who embarks on a pilgrimage to Canterbury Cathedral after losing her mother, sharing life lessons—in the best Chaucer tradition—with eight other women along the way. 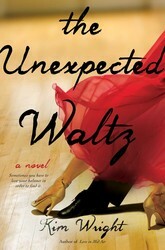 From the author of the critically acclaimed debut Love in Mid Air comes this moving novel about a middle-aged widow who finds her feet by embracing a new hobby: ballroom dancing. This sounds like a great read. Adding it to my TBR!!! Very cool trip! I’m looking forward to reading your book. That sounds like it was a wonderful journey and a great inspiration for your novel. The cover is so lovely and I can’t wait to read this book. 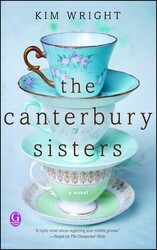 I really enjoyed The Canterbury sisters and the amazing journey they took. This is a special book!